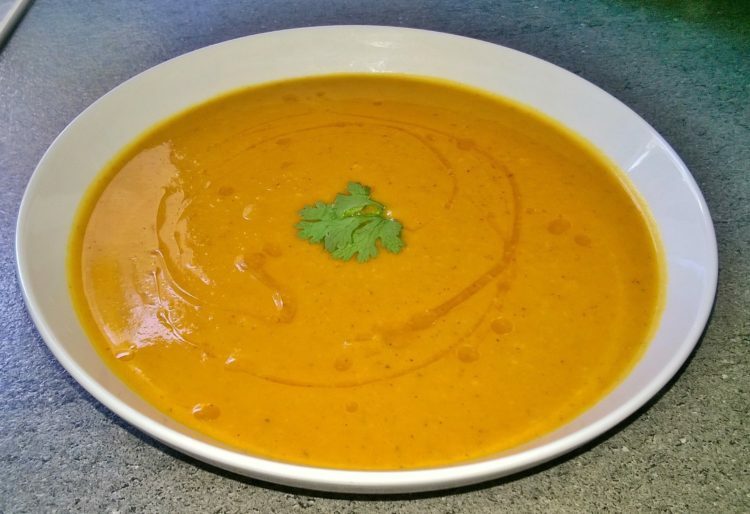 This is a warm flavoursome soup, perfect for a cold winter’s day. 1 Melt 1 tbsp of coconut oil in the microwave until it dissolves. 2 Put the sweet potato chunks and garlic cloves in a bowl along with ½ tsp of smoked paprika, ½ tsp of ground cumin and the dissolved coconut oil, and mix until the sweet potato is covered in the seasoning. Then pour out on baking tray and place in the middle of the oven for 15-20 minutes on 200c/400c/Gas6 until it has some colour. 3 In a large saucepan on medium heat add 1 tbsp of coconut oil, when it has dissolved add the onions and chilli then stir, after about 30 seconds add the remaining ground cumin, the remaining smoked paprika, and ground coriander stir. 4 After about 30 seconds add 2 tbsp water and the coconut then stir and place the lid on and cook for 2 minutes. 5 After 2 mins place the all the ingredients from the saucepan into the blender. 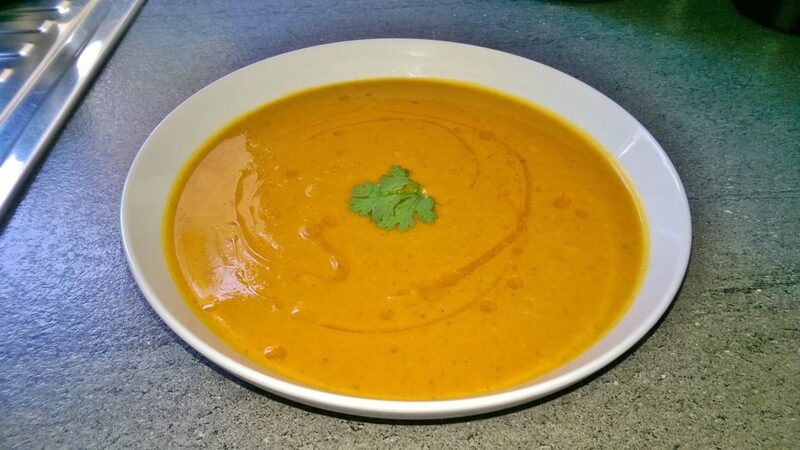 Then remove the sweet potatoes and garlic from the oven and add half in the blender along with the vegetable stock and water mix, then wiz until smooth. 6 Pour out the contents from the blender back into the saucepan. Then add the remaining sweet potato and garlic and coriander to the blender along with the boiling hot water, then wiz until smooth and pour it into the saucepan then stir. 7 Put the saucepan back on the hob on a high heat and bring to the boil, then stir and turn it down to a low heat and cook for 10 minutes stirring occasionally. 8 After 10 minutes remove saucepan from the heat, stir and serve in a bowl drizzle with 1 tsp chilli and a coriander leaf for garnish and enjoy. Red or Green Chilli contains anti-bacterial, anti-diabetic and lowers cholesterol. They are rich in vitamin-C which is important for the collagen required for blood vessels, skin, and bones. It also has vitamin-A, B-complex, capsaicin which relaxes blood vessels which lowers blood pressure, potassium which helps controlling heart rate and blood pressure. Black pepper helps to absorb selenium, B-complex vitamins, beta-carotene from foods. They are an anti-inflammatory and it contains potassium, calcium, zinc, manganese, iron, B-complex vitamins, vitamin-A and vitamin-C.